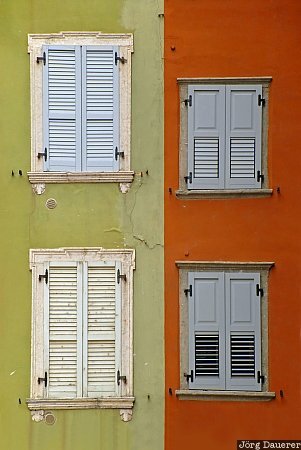 A colorful facade with closed white windows in Riva del Garda at the northern shore of Lake Garda (Lago di Garda). Riva del Garda is in the province Trentino-Alto Adige in northern Italy. This photo was taken at noon on a rainy day in October of 2010. This photo was taken with a digital camera.